Adobe has completely refused to distribute their products on DVD-ROM for a nominal cost, and moved to their distribution network for monthly paid subscription. Not all of this was to their liking. Among the opponents of the new order, and I, your humble servant. Largely because of this, you can, with this assembly, to use as before DVD-edited with the applicable one-time cure! Adobe Flash Professional CC - is a powerful environment for creating animation and multimedia content. Allows you to create expressive interactive projects, which are displayed in excellent quality on desktop computers and a variety of devices, including tablets and smartphones, as well as on television. Adobe Flash Professional CC also allows you to work with raster, vector and also with three-dimensional graphics using the GPU. Also supports bidirectional streaming of audio and video broadcast. PDA and other mobile devices, released a special "lite" version of the Flash Lite, which is limited in functionality, based on the capabilities of mobile devices and operating systems Android, iOS and others. 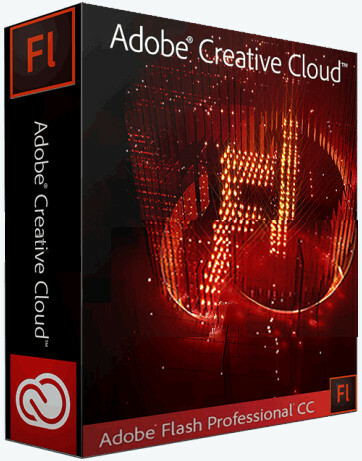 Adobe Flash Professional CC part of Creative Cloud. Therefore, it is available to users all the latest updates, and access to new versions available from the date of issue. Improve your skills and master new tools thanks to a large and growing collection of instructional videos. Through integration with the Behance can share their projects with other users and receive instant feedback on their work from designers from all over the world. "The benefits of Adobe Flash Professional CC"